FluffyKnitterDeb: It's my birthday and I'll have a contest if I want to! It's my birthday and I'll have a contest if I want to! 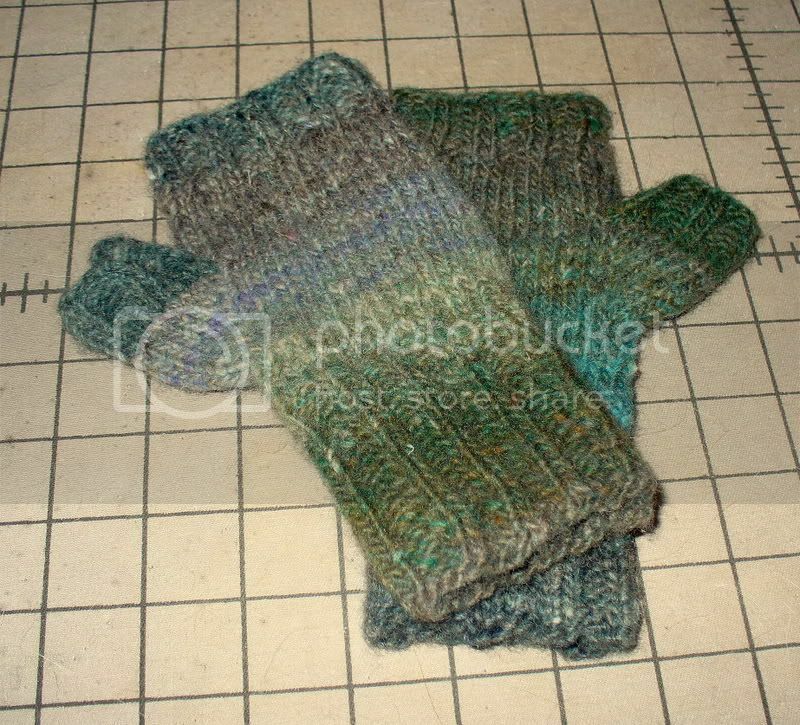 Before we get to the fun stuff, I'll get you up to date on the knitting front. First a big thanks for all the lovely compliments on my AV shell, it's become a real favorite in the FKD wardrobe! A reader asked what I'm doing for the bottom of the clogs so they wont be so slippery. I purchased the Fiber Trends Suede Slipper Bottoms and I'll show you how they look once the clogs dry and I can attach them. 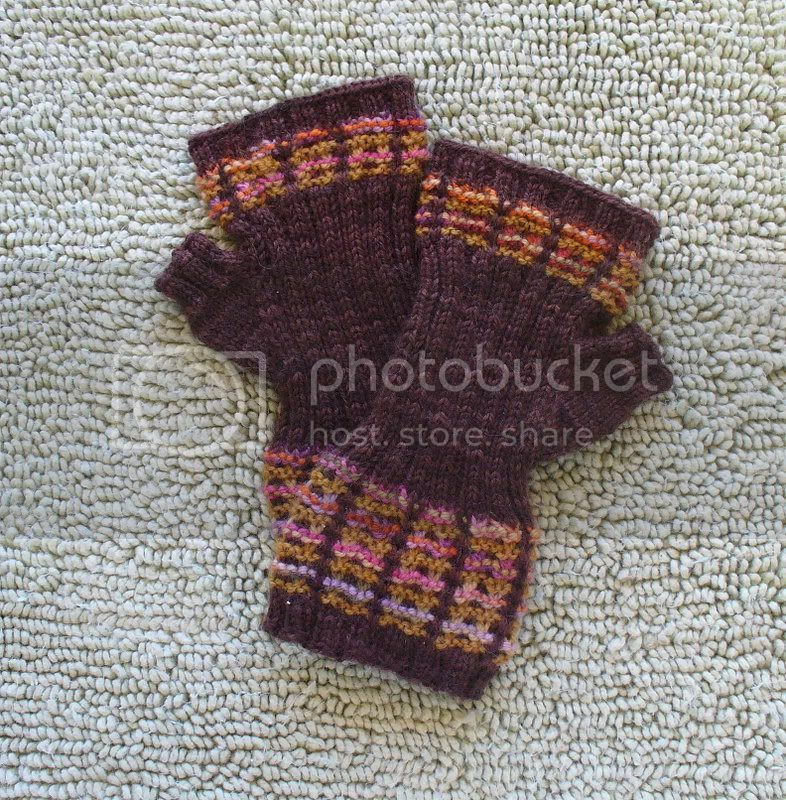 If these look a bit familiar it's probably because the FREE pattern has been sitting over there>>> on my side bar for all to enjoy! 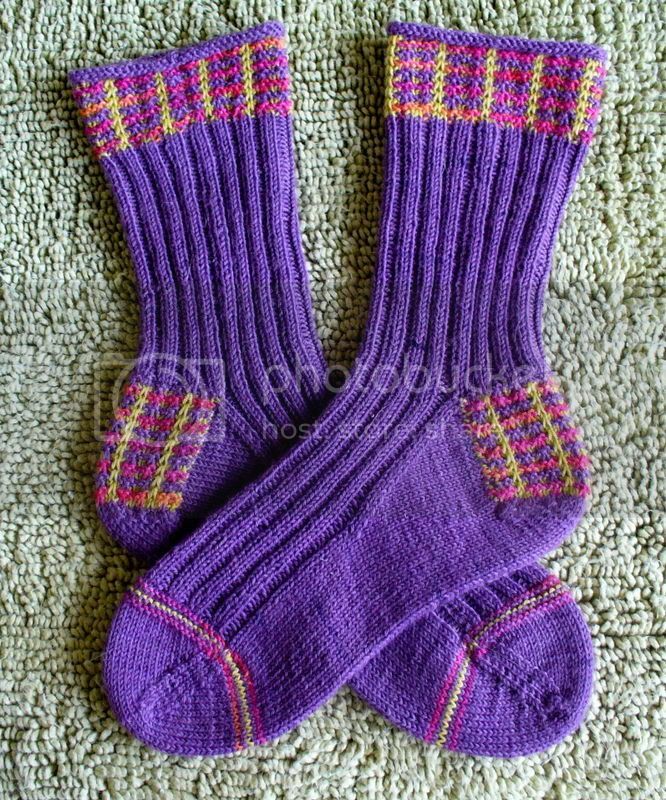 I'm revisiting these for a special friend (not Rob, hehe) because it's such a cool, manly pattern and because Lorna's Laces Shepherd Sport is my very favorite sportweight sock yarn! It's sooooooo soft, it makes knitting a complete pleasure! Of course I'm doing my *patented* mini-flap and gusset short row heel instead of the flap heel the patten was written for but it's still a great sock....you know you have some men in your lives who need a he-man sock and the holidays are just around the corner...just sayin'! 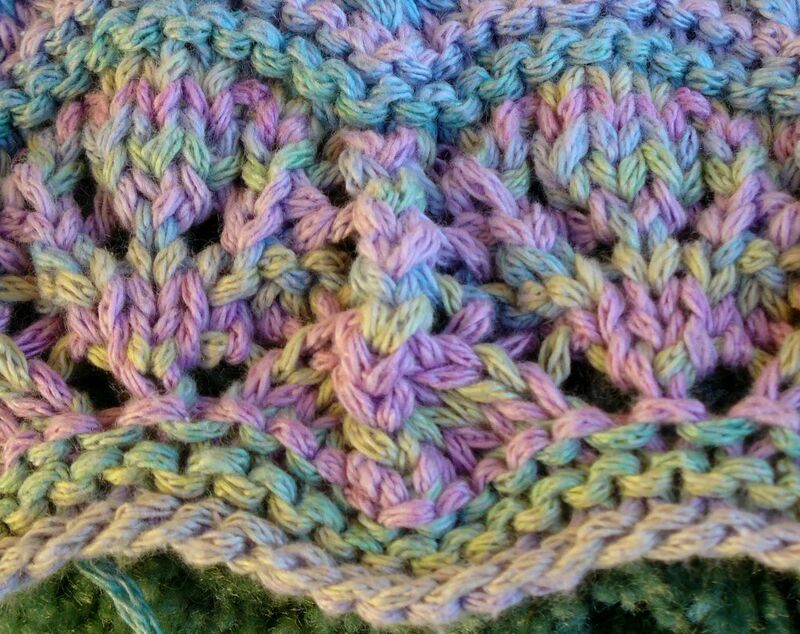 And try to guess what pattern I'm working on! All you have to do is leave your guess in my comments and you'll be eligible for the amazing FKD Birthday Prize!!! I'll use a random number generator to select the grand prize winner. You have until midnight EST next Sunday night, September 17, the eve of my actual birthday to leave me a guess to be entered in the contest! Being an avid sock knitter I'm alway eager to enable another member into joining the club so I've put together a very juicy (if I do say so myself) sock yarn bonanza prize package....it will be a wonderful surprise but think a little Koigu, maybe some Cherry Tree Hill or some Opal, some Miellenweit, some handpainted Wildfoote (the good stuff! 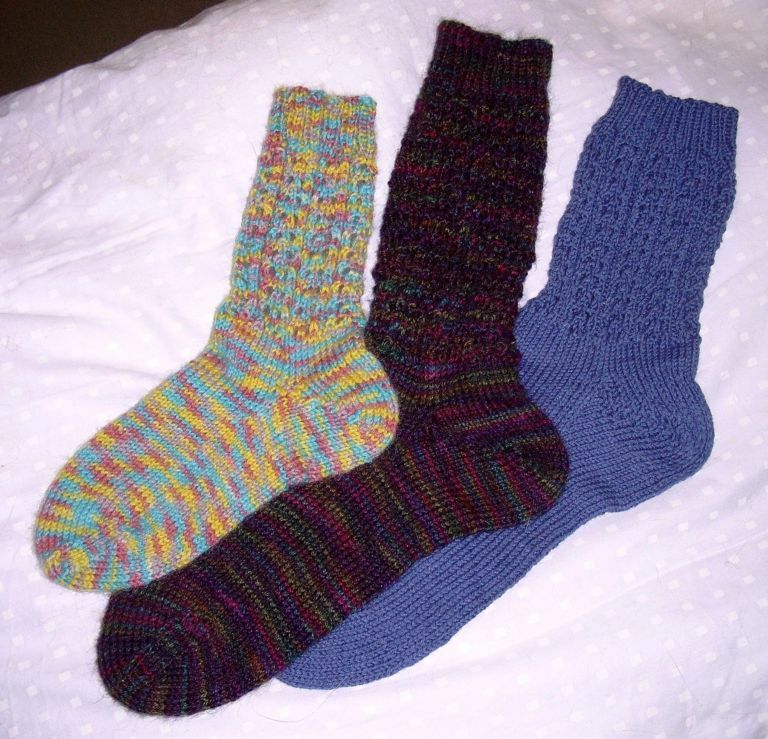 ), a bit of Trekking XXL.... a very well rounded sock knitting sampler will be had by the winner! So come celebrate my birthday with me and YOU could get the present! And says his lips are sealed but any and all *donations* of chicken, salmon or sausage and artichoke pizza will be greatfully accepted and not be considered a bribe in any way! yay! you're up and running for your bday week! as for the contest, i'm going to guess the lotus blossom tank. Yup, it's the Lotus Blossom tank! Happy Birthday! Here's to no hurricanes this year! It does indeed look like the Lotus Blossom pattern. No guesses, but plenty of Happy Birthdays to you, Debi! I'll see what I can do about the tasty pizza "donation." Happy, happy birthday! May you have many more healthy, happy days to come. I have to agree that it looks like the Lotus Blossom. Happy Birthday! Is it the Leilah Tank from knitting for boozhags? Happy Birthday! I think it looks like the Lotus Blossom too. The color is beautiful. I'm clueless as to the knit, but it's lovely and more importantly - HAPPY BIRTHDAY!!!!!! Yep - it's the Lotus Blossom tank. Happy Birthday early! Not sure what it is yet, but it's gorgeous yarn. Have a Happy Birthday! Everyone who said Lotus Blossom has to be right - there's nothing else it could be! But what's that yarn? I love the colors. Well Lotus Blossom it is.....the yarn I'm not so sure about. Whatever it is, it looks yummy! Happy Birthday!!!!! I was gonna guess Lotus Blossom..and when I read your comments, it seems to be the general consensus...I wanted to be different...but that's what it looks like to me. Well, I guess I don't get points for originality by guessing Lotus Blossum (aren't we all going to be embarassed if it ain't! ), but might as well plop my name into the random number generator! Hope you're back for good now. Always one to jump on the bandwagon, Lotus Blossom Tank! Well why not...I mean if I sent "donations" to the P-Man, it might be a bit "off" by the time it arrived from Canada so I will guess the Lotus Blossom tank and put myself in the contest! call me boring, but i think it's lotus blossom too! and i couldn't remember the name of it until i read all the previous comments (i was just going to say the cover sweater of summer IK magazine). It's pretty either way though. Welcome back to blogland! Seems as though Dell (it was Dell, right?) finally came through for you. Your mystery project looks like the Lotus Blossom Tank from the summer IK, I think. 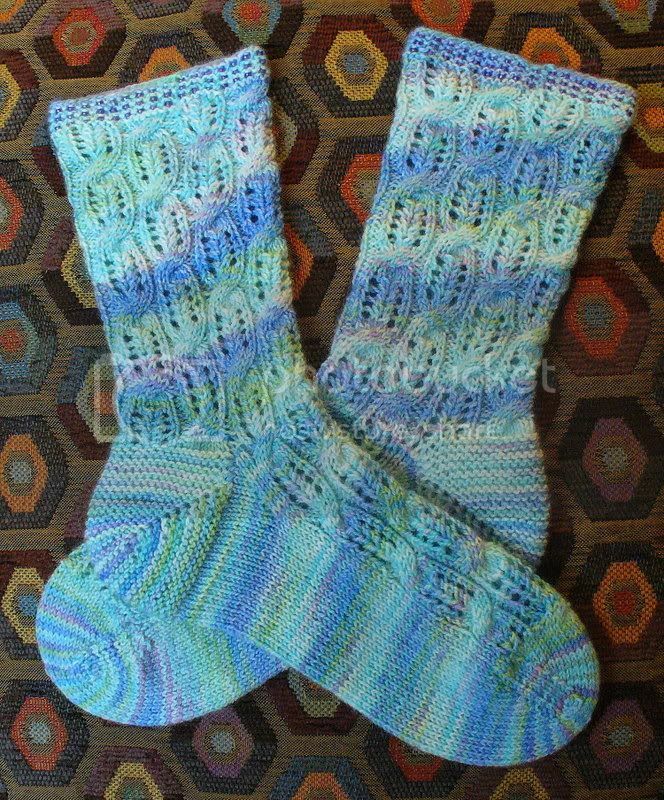 I like it in a variegated yarn! yay, the P-man is back! /delurking ... I knew I loved your blog but I didn't realize we share a birthday!! Happy birthday to us and welcome back! p.s. It's a lotus blossum tank and the variegated yarn is beautiful. Lotus blossom! I'll go fer it too. Happy Virgo birthday from another september girl. And the Vitadinni tank is STUNNING! who said it was silly to knit in Florida? that is GORGEOUS! yeah... kind of looks like the Lotus Blossom tank to me too. It looks like the Lotus Blossom Tank. Happy Birthday! I have no idea what that pattern is ... so just a wild random guess ... is it Soleil (did I spell correctly?)? Happy Birthday! Yep, it's the Lotus Blossom Tank--I bought that issue of Interweave for the Icarus pattern. I like your yarn choice; it looks so different in the vargated yarn. I'll go with the Lotus Blossom Tank, too, even though I had to google it to see what it looks like! I agree with Kendra, it's going to look beautiful in your yarn! And a lot like mixed blossoms, too! Thanks for the contest -- I love these! Happiest of Happy Birthdays!!!! Hope you have a wonderful celebration. The lotus blossom contingent is probably right, but I wanted to guess "Wings of the Moth". Just cause I haven't seen any lace wraps in a while. i love blog contests. i wish you a very happy birthday! So, I missed your birthday. I hope it was happy! Lotus Blossom Tank. Hey my birthday was just 8/30 so the prize could be a belated present to me!! just to be original my guess is the Lotus Blossom Tank! I've been "lurking" for the past few weeks, keeping up with your computer troubles. I don't envy you with all the problems you've had! I'm going to guess that what you're knitting is the Lotus Blossom Tank. Looks gorgeous! Thank you very much for your message of support about the death of my cousin. I appreciate it very much. And P-Man is looking spiffy as always...saw a lovely grey/white version of him this weekend at National Capital Cat Show - he wanted OUT of his cage. Talking about how awful it was in there, how ill-treated he was (yeah, right!) and on and on...When I wouldn't agree to help him escape, he threw himself down on his side in a HUFF and SIGHED...it was tooo funny! 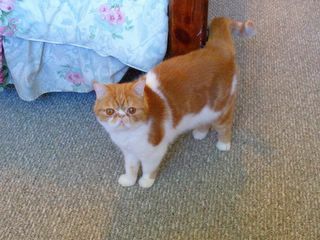 and your cat is SO FRIGGIN CUTE!!! Happy Birthday! Keep a weather eye out on the mail towards the end of the week. And tell the stud muffin that sassy included something extra special for him. I'd guess, but I've already benefitted immensely from one of you awesome sock kits, so I'll let others have a chance! Hope you're both staying dry! Yeah, I gotta agree with the Lotus massess. Happy Birthday. Lotus! Lotus! Lotus! Happy Birthday! Happy Birthday! Happy Birthday! Love the colors of this btw. I'll go out on a limb and say Lotus Blossom Tank. It will be stunning in your yarn choice! 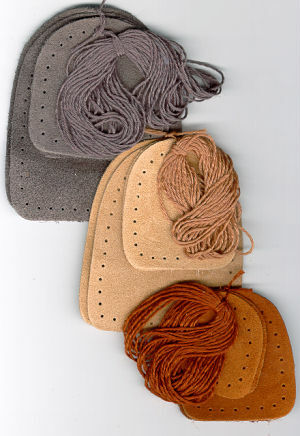 I have two more thoughts on non-skid bottoms for felted clogs--aside from wearing them only on carpeted floors!! First, the fabric stores sell a squeeze tube of goop that is just for this purpose. The best thing is that you can make your own design--i.e. the name of the owner of the clogs, etc. The stuff is washable and is fun. Second, fabric stores also sell the knitted fabric with little dots of non skid stuff--the same fabric that is used in some of the footed sleepers for kids. This is nice because it stretches and can conform to the "feel" of the felted clog. I've only found it in white, however. Lotus Blossom Tank? Happy Birthday! Happy Birthday. I'm going to go out on a limb here and guess it's the Lotus Blossom Tank? Oops, seem to have become anonymous accidentally (that's me above by the way). What a doll that P-man is. Is it ok to call him a doll? Hope you have something fun planned for the weekend so you can start celebrating and not stop for a week!! Lotus Blossom, me too, me too. That cat does have the look of a man who could be bribed. ok, did I say to look out for a package at the end of the week? ahem...ermmmm...I meant, sometime this weekend, but more likely Monday. Happy Birthday! :-) And I don't know the pattern. 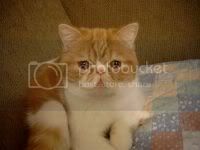 :-( But I love the latest cat picture and wish I could share artichoke pizza with him in person! Happy Birthday! And after perusing my IK from Summer of 2006, I'm going to say Lotus Blossom Tank. Love the colors of the yarn! Can't wait until you tell us what it is! Happy Birthday, I hope you have a BIG day of celebrating in store. My guess was going to be one of the new shawls we see around blog land, but when you said there was a Knit Along I have to guess: Lotus Bloosom Tank! 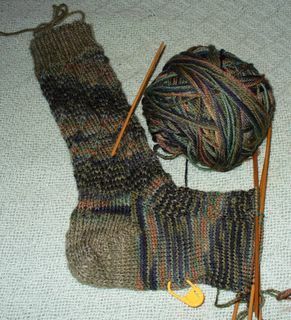 I love the way the color is showing on that new sock. 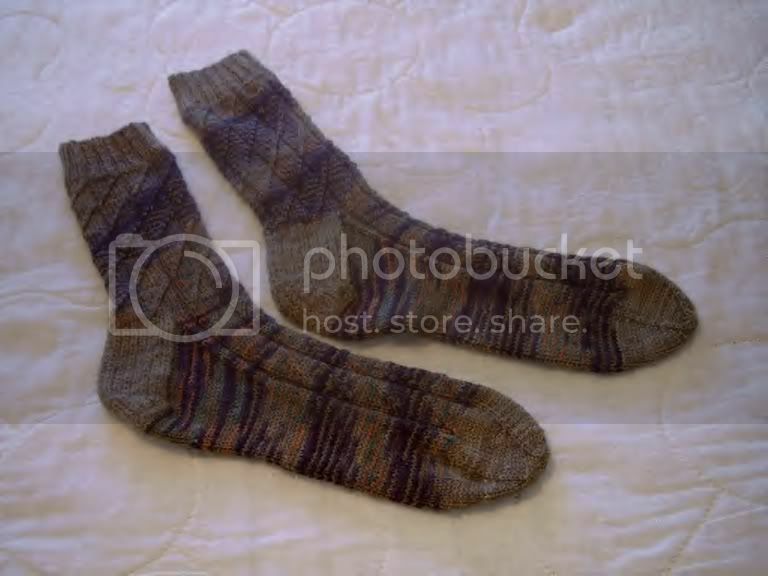 Now to find a man to knit it for, I've got three but not one of them likes hand knit socks! Enjoy your day! Snuggles to the P-man. My guess would be the Lotus blossom tank. My guess is for the Lotus Blossom Tank. Have a fabulous birthday! Your cat is such a cutie. My guess on the pattern is the lotus blossom tank. 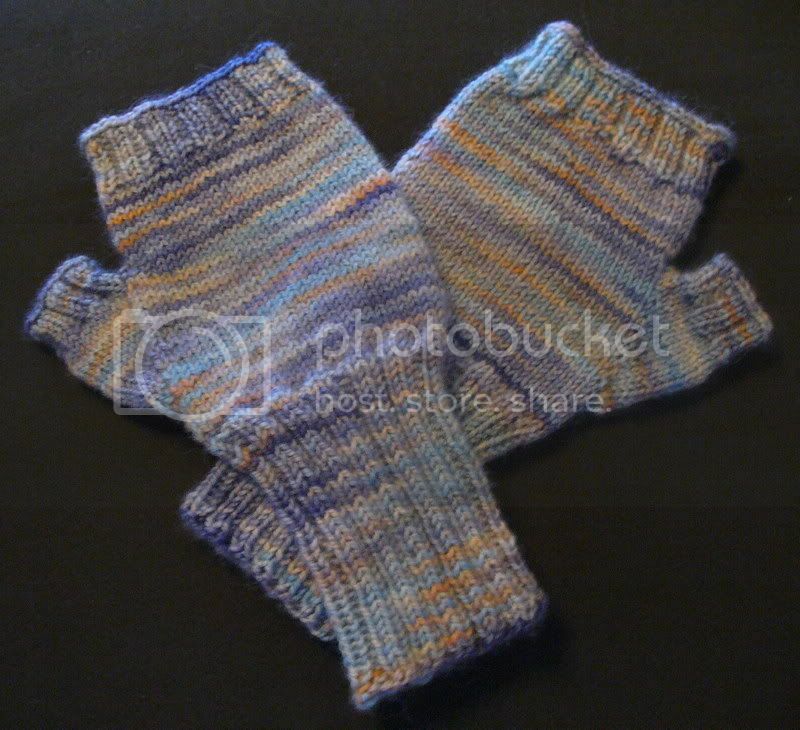 Love the colorway you are using! I absolutely love your cabled tank! It's beautiful! My guess for this next project - the lotus blossom tank. Early wishes for a happy birthday and your have a very cute putdy tat too! I believe it's the Lotus Blossom Tank. I've been looking at it but would have to knit sleeves - it's too cool here in NE (and my arms are too fluffy) to go without sleeves. Happy Birthday, Debi! Mine is this coming Thursday, the 21st. Wanna share some pumpkin pecan pie?? That's my b-day cake this year! Sallee sent me to wish you a fabulous Happy Birthday, and I am sure glad I caught the gorgeous sky photo! 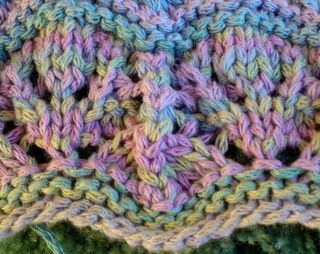 I was thinking of a few lacy shawl patterns till I saw the needle size you are using, so now I haven't a clue but the colors sure are lovely.